From mid-December 2018 tramline 2 will be the cheapest and fastest way to travel to Nice Côte d’Azur Airport (NCE) from the city center, Vieux Ville, and port. Getting to Nice-Côte d’Azur Airport from 2019 will be cheapest, easiest and fastest on the new west-east tramline 2. The tram runs from Aéroport Terminal 2 and Aéroport Terminal 1 parallel to the Mediterranean coast and the Promenade des Anglais to the old town and city center of Nice Ville to terminate at the Port Lympia. Trams will run up to once every three minutes with total traveling time over the full route only 26 minutes. Once operational, the tram will replace the airport express buses 98 and 99 as the best way to travel from downtown Nice to the airport and in contrast to these buses, the tram will have no airport surcharge and thus cost only the standard €1.50 per journey. Nice’s Tram Line 2 (Ligne 2 de Tram) will run from Nice-Port Lympia to either Nice Côte d’Azur Airport (NCE) or to the CADAM prefectural administration center in the western outskirts of the city. It is thus sometimes also referred to as the West-East line and enter operations in phases during 2018 and 2019. En route from Port Lympia to the east of Nice’s town center, the tram passes through a tunnel underneath the old town and town center. It emerges from the tunnel near Magnan and travels above ground, mostly along Avenue de la Californie that runs parallel to the more famous Promenade des Anglais (and the Mediterranean Sea). At Grand Arénas near Saint Augustin SNCF train station, the line splits with some trams going to CADAM Centre Adminsitratif and others to Nice Airport to stop directly at both Aéroport Terminal 1 and Aéroport Terminal 2. Traveling on the tram between Airport Terminal 2 and Terminal 1 is free. Traveling time on the tram will be only 26 minutes from Nice Airport to Port Lympia. Trams will operate at high frequency with three-minute intervals during peak periods. The flat-floor access trams have a capacity of 300 passengers per journey. In contrast to the Airport Express buses 98 and 98, the tram will have no airport surcharge and thus cost only the standard fare – currently €1.50 with free transfers to other buses for 74 minutes. Buy tickets from vending machines (or the ticket window at the airport or online) before boarding the tram – some tickets need validation before traveling. Cadam to Magnan is already functioning – Grand Arénas stop is near the airport. Nice Airport Terminal 2 and Terminal 1 to Magnan from 15 December 2018. Nice Airport / CADAM to Jean Médecin in the center of Nice is due to open by mid-2019. The full line 2 should be operational from Nice Airport / CADAM to Nice Port Lympia by the end of 2019. Further expansions are planned but still years away. Grand Arénas – close to Nice-Saint Augustin station (although it remains possible to walk from the airport to the station, especially when traveling without luggage). Most regional trains stop at Nice-Saint Augustin SNCF station making it often more convenient than traveling via Nice-Ville SNCF main station. Jean Médecin – with Tram Line 1 and one stop to Gare Thiers (Nice Ville main train station) or to Masséna with many bus lines. Garibaldi / Le Château – with Tram Line 1 and many bus lines. 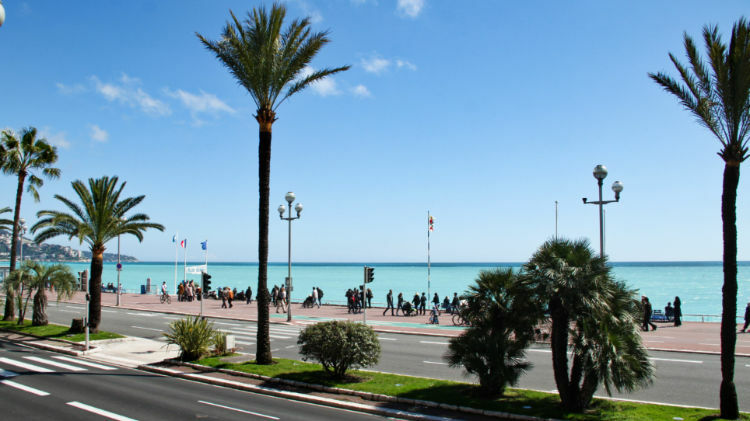 It is expected that the opening of tramline 2 will reduce car traffic on the Promenade des Anglais by 20% or 20,000 cars per day. It will also led to a reduction in buses with the airport express buses 98 and 99 likely to be cancelled once the tramline is fully operational.